Background: The current Women's Football League in Philly (Firebirds) were once known as "Phoenix". Phoenix is also an Arizona city, an online University, a band, and a mythical sacred firebird. Aptly-named in the mythology symbolism of "rebirth", this Phoenix team replaces the original Philly AUDL team which departed in 2012. First impression(s): A team with 2 cities in their name is kinda awkward. The design styles - phoenix (Ed Hardy); skyline (retro 70's) - are somewhat mismatched, but somehow work. This logo has much improved since first launched! 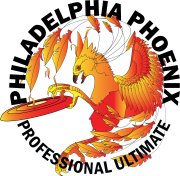 Eli's Eval: The designer of the Windy City Wildfire logo needs to look no further than the Philly Phoenix logo to see beautifully rendered flames. And these aren't just flames trailing a disc, they form a freaking Phoenix! This is the most artistic design so far. A proud phoenix built of vector-based flames. The rendering is crisp enough that you could print this without the gradients and probably in black and white and it would still hold up. The type looks like a custom Hydro74 font called "Ocelot Piss", arced below a silhouetted skyline. On the main homepage they have a red stroke around the bright yellow type which is unnecessary. There are red knockouts in the "E" in Phoenix &/or around the "P" in phoenix that are inconsistent across their merchandise and website. I can't imagine these were meant to be here, but points off for inconsistency and poor execution. In spite of a few small problems, this is among the best of the bunch. Though the phoenix shape as a silhouette loses some definition at smaller sizes. And it is original, as far as I can tell. The fact that you gave this the most positive evaluation of all the logos considered makes me seriously question your judgment and doubt the legitimacy of every one of your other reviews. I don't know if you do graphic design for a living but I sincerely hope no one ever pays you to do work that looks like this. the separation of the dragon and the city is too much and the Photoshop-squeezed text reminds me of 1997 typography tricks that didn't look good then and don't look good now. the typeface is nice and overall this is a decent design -- maybe a B -- but an A? with that unnecessarily separated dragon and city and "professional ultimate" text at the bottom? Current Logo for DC Current?